It’s one company that gave dealers 3 super performance 1963 models. The world-famous Avanti, R2 Super Hawk and R2 Super Lark – cars with proven superiority of Studebaker’s chassis design – equipped to withstand speeds and stresses far in excess of day-to-day requirements. Dramatic evidence was shown when Avanti topped 168 mph, Super Hawk 140 mph, and Super Lark 132 mph during certified performance and safety evaluation tests at Bonneville. Speeds almost twice as fast as you should drive. 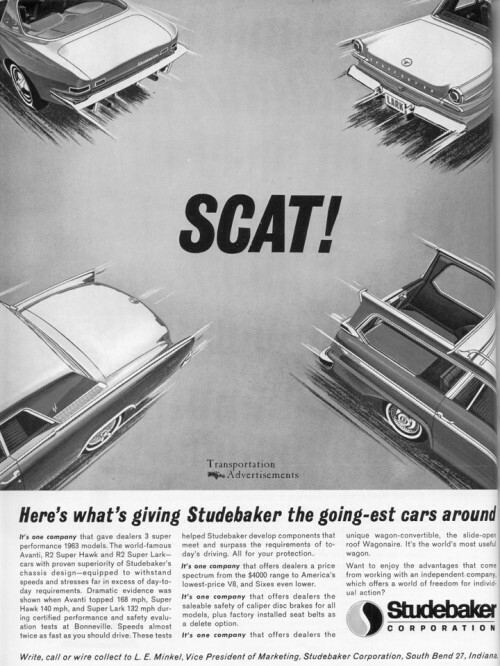 These tests helped Studebaker develop components that meet and surpass the requirements of today’s driving. All for your protection. It’s one company that offers dealers a price spectrum from the $4000 range to America’s lowest-price V8, and Sixes even lower. It’s one company that offers dealers the saleable safety of caliper disk brakes for all models, plus factory installed seat belts as a delete option. It’s one company that offers dealers the unique wagon-convertible. the slide-open roof Wagonaire. It’s the world’s most useful wagon. Want to enjoy the advantages that come from working with an independent company, which offers a world of freedom for individual action?